In our recent blog, Barriers to CAC/PIV Secure Printing Implementation, we identified reasons why federal agencies have held off implementing CAC/PIV secure printing despite its security benefits. 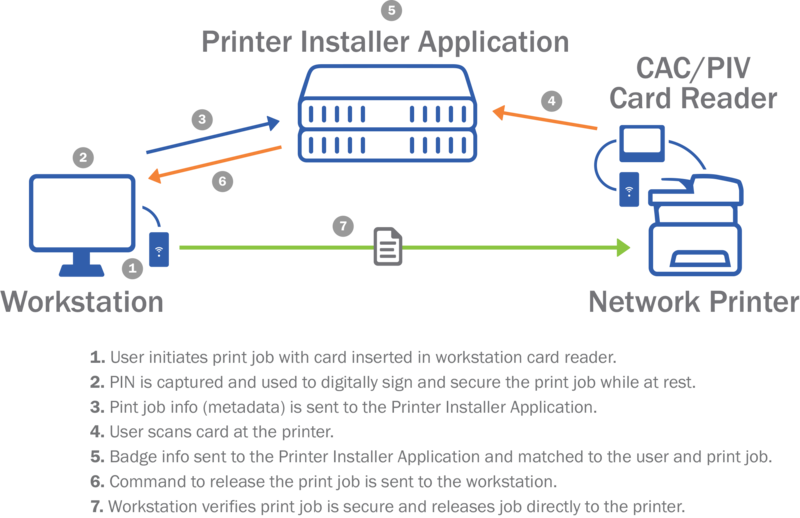 Based on this research, and a careful analysis of other solutions in the market, PrinterLogic has developed a unique, cost-effective CAC/PIV pull-printing approach that works with ANY network printer, requires no print servers, and gives complete visibility into print activity on the network. PrinterLogic uses a print-management application called Printer Installer to manage the enterprise print environment and eliminate or reduce the print-server footprint. We help customers eliminate print servers and migrate their environment to a centrally managed direct-IP printing architecture. This architecture is the key to achieving a serverless CAC/PIV secure print-release model. This serverless solution works within the PrinterLogic architecture and is managed by the Printer Installer software. It maintains the full functionality of print servers while replacing them. It provides a more manageable print environment that is more friendly for end users. The solution includes printer-driver deployment and management, print-job auditing and reporting, and centralized printer management from a single web-based console. Digitally signing all print jobs created by the user using their CAC/PIV card certificate at the point of print job creation (the user’s workstation). The job is then held securely in the user’s local print queue securely until released at any PrinterLogic CAC/PIV-enabled printer or MFP. Moving to a direct-IP print architecture, reducing risk from centralized points of failure and security compromise. Print jobs are never held at the MFP, or at any centralized print server. Simplified infrastructure. With Printer Installer you can eliminate all your print servers and dramatically simplify your infrastructure. Works with any networked printer. 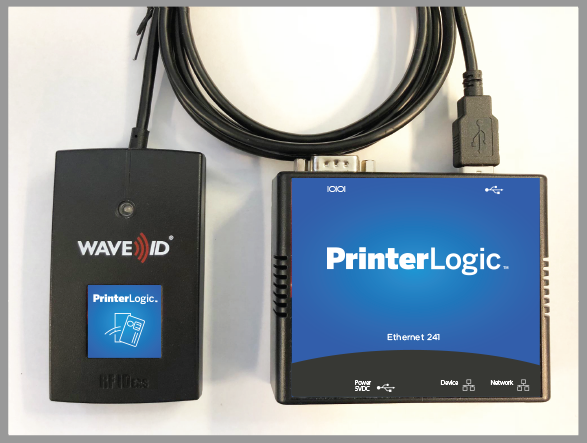 PrinterLogic employs a CAC/PIV-enabled E-241 Badge Reader, which connects to existing printers. End users swipe their smart card over the reader to authenticate and release their print jobs. This solution works with any make or model of printer, and is very cost-effective compared with wholesale replacement of your fleet. Improved visibility into printing activities, which can inform cost and waste cutting. Obtain data that helps with cost-reduction initiatives. This includes desktop USB-connected printers. Assign costs to specific printers, paper types and modes (color, B&W, etc.) to help calculate and monitor printing costs. Identify opportunities to consolidate printing devices. Empower your end users. Using PrinterLogic’s Self-service Installation Portal, end users can quickly find and install nearby printers without having to wait for IT staff assistance, using a visual floor-plan map. Streamline printer provisioning management. Manage all printer provisioning in your entire enterprise through a single web-based console without scripts or complicated GPOs. Reduce help-desk calls. Using PrinterLogic’s self-service printer installation means end users are less likely to contact your help desk for printer problems. Eliminating print servers is compelling, but we realize not every organization can eliminate all of its print servers because some applications require them. PrinterLogic can work in these hybrid environments. We also understand that buying a new printer and MFP fleet every three to five years is not cost effective, which is why our CAC/PIV solution is designed to work with your existing printers. We’ve shown how PrinterLogic’s research with federal agencies has led to a unique, cost-effective CAC/PIV pull-printing approach that works with ANY network printer, requires no print servers, and gives complete visibility into print activity on the network. To see how PrinterLogic's secure pull-printing functionality can work for you, call our Federal Sales Desk at 435-216-1939 for more information, or to schedule a WebEx demonstration and a 30-day free trial.